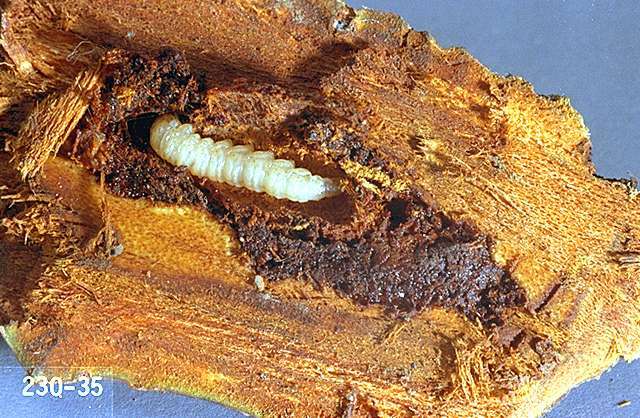 Biology and life history The borer overwinters as a larva on or under the tree bark, usually below ground. 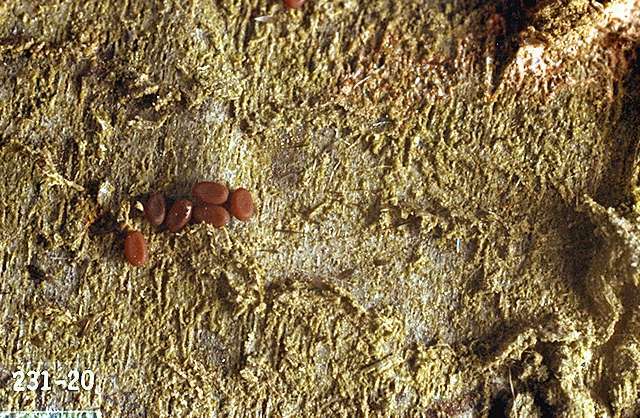 As temperatures rise above 50°F in the spring, the larva resumes feeding on the tissues under the bark. At maturity in May and June, the larva pupates. Adult moths emerge beginning in June and continue through September. Eggs are laid quickly after mating. Young larvae hatch after 8 to 10 days and bore immediately into the base of the tree. Larvae in the bark above the soil line usually do not survive the winter in cold areas. 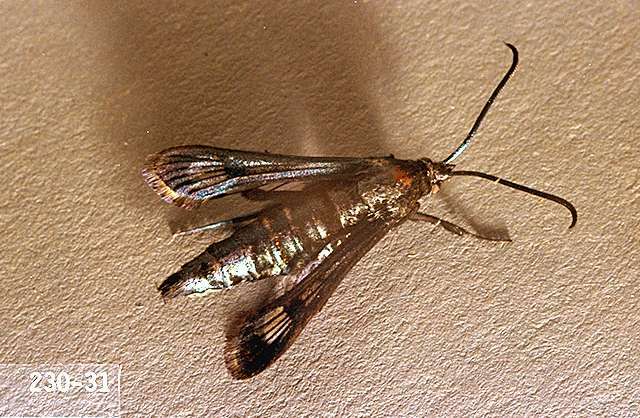 Pest monitoring Monitor for flying clearwing moths by using pheromone traps starting in mid-June or watch for gummy frass at base of trees. 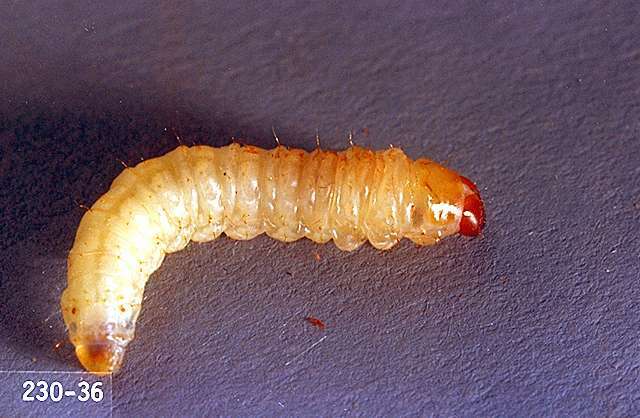 This insect can do substantial damage if not controlled: one larva can kill a small tree. Pheromone mating disruption (Isomate P) at 100-250 dispensers/a. Dispensers must be placed in trees before first moth flight. Flight is usually from late June through September. If mating disruption is used, monitor blocks with traps baited with peachtree borer lures at 1 trap/2.5 a. If two or more moths are caught, a conventional insecticide application may be required. Place a light metal or flexible plastic cone around the base of the tree before egg laying begins to protect it from larval entry. The cone should be pushed 1 to 2 inches into the soil and should fit snugly around the trunk at the top to prevent the tiny larvae from getting beneath it. Budding tape or other flexible material helps seal the top. Alternatively, if only one or a few peach trees are involved in a home orchard, it is quicker and cheaper to control this insect by direct removal: use a pocket knife or some pointed instrument to remove dirt around the tree and dig out the larvae.